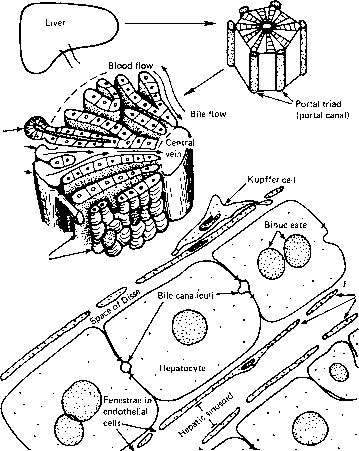 FIGURE 10-5 Anatomical components of the liver and hepatocyte, a major target cell for glucocorticoids. This drawing was made originally by Dr. Laurie Paavola, Department of Anatomy, Temple Medical School, and is redrawn here with her permission. Other work with a polyclonal antibody to the glucocorticoid receptor indicates that the hepatocyte is the cell in the liver having a large number of receptor antigens, while the bile and Kupffer cells have little or no antigenic activity.